If you’re thinking about going to college to shore up your future, that’s a smart impulse. The pay gap between college grads and everyone else has never been bigger. Today, college graduates earn 56% more on average than people with a high school diploma or less. Unfortunately, college has never seemed so expensive, either. The good news is there are opportunities for Kansans like you to get a college education without burying yourself in debt. Each year, the U.S. government, the state of Kansas, and thousands of private groups offer scholarships and grants to students just like you. Our goal is to help you decide which of those opportunities to apply for and how. You’d be surprised how much money is given out each year. Following the four steps below, we hope to help you start planning so you don’t miss out. The first step in applying for financial aid is the same for every American: filling out FAFSA. FAFSA, otherwise known as the Free Application for Federal Student Aid, can be tedious. That’s why we made a guide to help you through each step. If you get frustrated, just remember the government has an annual budget of about $120 billion for FAFSA, awarding over 13 million students with money. You could easily be one of them. It’s in your best interest to get your FAFSA forms filled out as quickly as possible. In fact, if you really wanted to, you could take a break and get them started right now. But don’t panic!! You don’t have to finish applying today. The point is, some financial aid is awarded on a first-come, first-serve basis. You don’t need to know which school you’ll be attending—or even where you’ll be accepted—to send in your forms, so there is nothing holding you back! And the early bird often gets the worm. FAFSA automatically ensures that you’re considered for some state grants, but there are many additional opportunities available to you as a Kansan. However, some state-specific grants and scholarships require additional applications. But you’re in luck!The Kansas Board of Regents provides a single application that puts you into consideration for most of the grants and scholarships below. Kansas Comprehensive Grant for residents with exceptional financial need, who are enrolled full-time at one of 25 designated Kansas colleges/universities. Career Technical Workforce Grant for students enrolled in a designated career technical education program. Kansas State Scholarship for financially needy students in the top 20-30% of Kansas high school graduates. Kansas Ethnic Minority Scholarship for academically competitive students in financial need who are African American, American Indian or Alaskan Native, Asian or Pacific Islander; or Hispanic. Kansas Military Service Scholarship for applicants who have served overseas in the U.S. military since September 11, 2001. Kansas ROTC Service Scholarship for those committed to serving as commissioned officers in the Kansas Army National Guard for a minimum of four years. Kansas Nursing Service Scholarship for nursing students committed to practicing as LPNs or RNs in Kansas hospitals post-graduation. Kansas Teacher Service Scholarship for future teachers dedicated to working in hard-to-fill positions or underserved areas throughout Kansas. Also unique to Kansas are the tuition waiver policies available to dependents and spouses of deceased public safety officers, military personnel,and prisoners of war; and for students who spent time in the foster system. Another interesting opportunity available to you and other Midwesterners is the Midwest Student Exchange Program. The program aims to expand interstate opportunities for residents of Illinois, Kansas, Indiana, Michigan, Minnesota, Missouri, Nebraska, North Dakota, Ohio, and Wisconsin by offering interstate tuition discounts. Click here to apply for state-specific aid. Check the table of contents to find the application for each offering. Some scholarships can’t quite be classified as federal or state-based. You should check your high school guidance office weekly for additional scholarship postings. In addition, you should research what’s offered through the particular college you plan to attend. For example, the University of Kansas’ scholarship page describes many opportunities—some for applicants with exceptional standardized test scores, and even one for students who’ve been discriminated against for supporting the LGBT community. Community colleges often have opportunities posted on their websites, as well. Read carefully; you might be able to find scholarships reserved for your intended major or course of study. To encourage participation in the agricultural field, the Kansas Livestock Association (KLA) offers a variety of scholarships. Click here for more information on KLA scholarships. You can apply for scholarships based on almost anything imaginable, from faith, to athletics, to physical characteristics, and beliefs. Would you believe us if we told you it’s possible to get scholarship money for being tall? What about for being a vegetarian? Click here to browse some more cool and unusual scholarship opportunities. If you’ve applied to all of the national, state, and local grants and scholarships you can and are still in need of a bit more financial help, a private loan can help you close that gap. 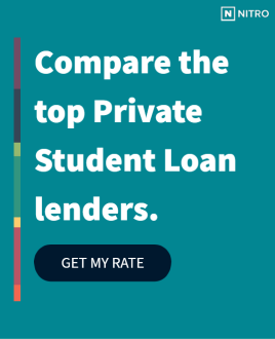 Click here to see the Best Banks for Private Student Loans. Unlike grants and scholarships, loans will have to be paid back over time, so It’s important for you to understand how they’ll affect you. Our free NitroScore tool will produce a score based on your total costs, post-graduation salary, and potential loans needed at the college/major of your choice. The score will give you an idea of how easy it’ll be for you to pay off your loans based on your projected salary. Once you feel right about your decision to take out loans, use the NitroScore tool to decide which of our trusted partners can offer you the best rate. There’s a way for you to make college affordable. The key is great planning.